Wednesday started off for me at 9 in the morning with attending a press conference - PC6 - about the marks of the anthropocene. Two of the four presentation had a connection to climate change, so I‘ll focus on those, but the other two were also interesting (Kira Lappé about signs of the Anthropocene underneath Vienna (abstract) and Pau Calatayud-Vernich about Pesticide residues in honey bees, pollen and beeswax (abstract). Thanks to the press conference being live-streamed, it was easy to capture images from the presenters and their presentations. For a larger version, please click on the image or here. Caroline Clason shared her research about fallout radionuclides (FRNs), a product of nuclear accidents and weapons testing which are known environmental contaminants. Emerging research is revealing that FRNs and other contaminants are being stored within and released from glaciers following deposition onto the snow/ice surface years or decades before present. As glaciers retreat there is thus a risk of secondary release of high concentrations of contaminants into the proglacial environment through melting and down-wasting of the ice. The research is summarised in this poster and Caroline Clason's presentation is available here. Steffen Lohrey talked about deadly heatwaves and how these predominately affect the global poor (abstract). In his presentation he showed how population growth and increasing deadly heatwaves coincide particularly in the global south. While sensitivity analysis demonstrates high uncertainty in prospective outcomes, the results quantify in how far poor and rapidly urbanizing cities in the Global South will be impacted most by deadly heat. The press conference was streamed live and you can watch the recording here. 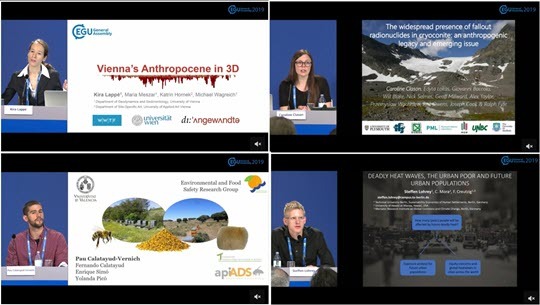 After a short break I went to a panel discussion about Rewards and recognition in science: what value should we place on contributions that cannot be easily measured which was one of the featured great debates at EGU 2019. Moderated by AGU President Robin Bell, the panelists Liz Allen from King's College London, Stephen Curry from Imperial College London and Demetris Koutsoyiannis from the Technical University of Athens shared their thoughts about "What counts may not be countable and what is countable may not count". For some memorable quotes about the session, check out Sarah Connors Twitter thread. Thanks to attending this session, I became aware of the follow-up lunch-time Science and Society Symposium happening - rather conveniently! - in the same room: Science, Politics and European (dis)integration: A conversation of Geoscientists with Ilaria Capua and Mario Monti. Due to the high-profile speakers and relevance of the topic in the runup to the elections in the European Union at the end of May, the room filled up quickly, so it was a good thing that I already had my seat from the previous session! The session was live-streamed and watching the recording (1:12) is well worth it! To complete the day, I joined session EOS2.4 - Games for Geoscience where some educational games were explained and how they can be used to teach pupils about different aspects of (geo)sciences. The creativity involved in creating the games is quite amazing: Cold Cooperation for example tasks players with balancing economic development and the survival of Arctic sea ice (if all sea ice vanishes, all eight teams lose!) Hazagora asks "Will you survive the next disaster?" while "Common pool resource dilemma" delves into the concept of the tragedy of the commons.